We finally made it to Food Truck Wednesday in the Highlands and got to try some infamous ‘Street Meat’. I have to say I really enjoyed the whole scene. People out in the sun roaming from truck to truck, finding empty spots on the concrete to sit and chat while they ate. It really was a lot of fun. All the usual suspects were out and we got the chance to dabble around with, Yumbii, Slider U, Just Loaf'N Po'Boys and Honeysuckle Gelato. We started with a rib-eye taco from Yumbii which was pretty yummy. Tender meat, finger licking sauce....not complaints here. From Slider U, we had a Philly Cheesesteak Slider and a Cheeseburger Slider.... the Cheesesteak won the best 'Street Meat' for the night for us. The meat was tender and delicious with just enough cheese and onions, it really was delish! From Just Loaf'N Po'Boys, we had a Soft Shell Crab Po'Boy. I have to say I was a little disappointed. The mambo sauce that they dressed the sandwich with was bland and the crab was a little too salty. I do like the nice crusty hoagies they used though, just need to work on something better for in between the bread. And last but not least we shared some Banana Sorbet from Honeysuckle Gelato. Delish! I wish that it was more a gelato then a sorbet so it would be a little creamier, but nonetheless it was a delicious way to end the night. ﻿There are so many other Food Trucks out there to try, we will definitely be partaking in more 'Street Meat' in the future. Get out and try a few things for yourself! 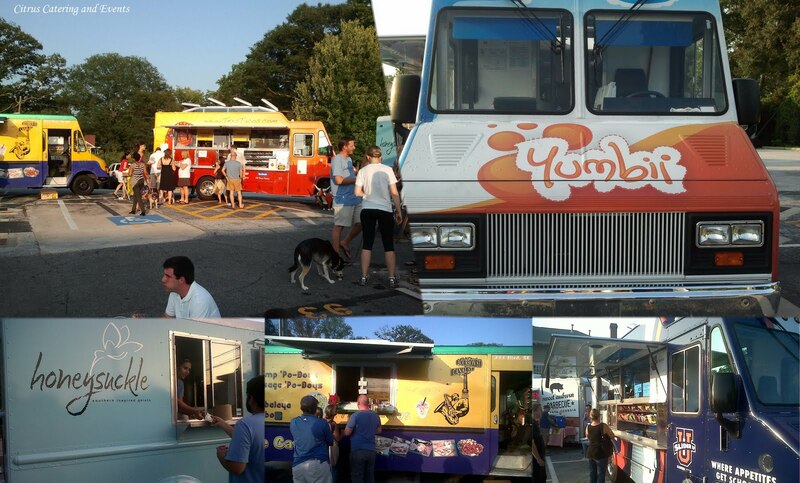 Checkout my original post on Food Trucks for details on where and when to find them. Hope you all have a wonderful weekend! See you back here on Monday for "Monday Funday"! Good food and even better company. *wink*. That soft shell crab was nasty to me though! Yeah, the crab was def a too salty... I should have gotten a slider!